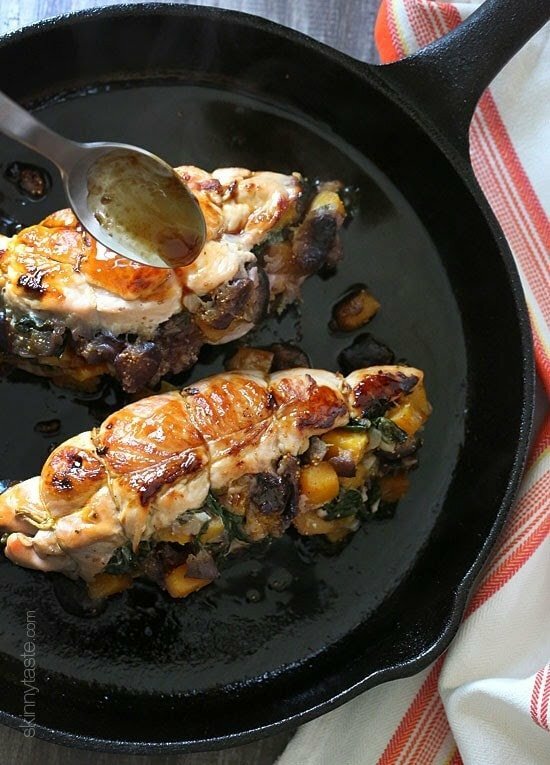 Stuffed Turkey Breasts with Butternut Squash and Figs is a wonderful One-Pan Fall dish. This is also Whole30 compliant as well as gluten-free, low-carb, keto and Paleo. 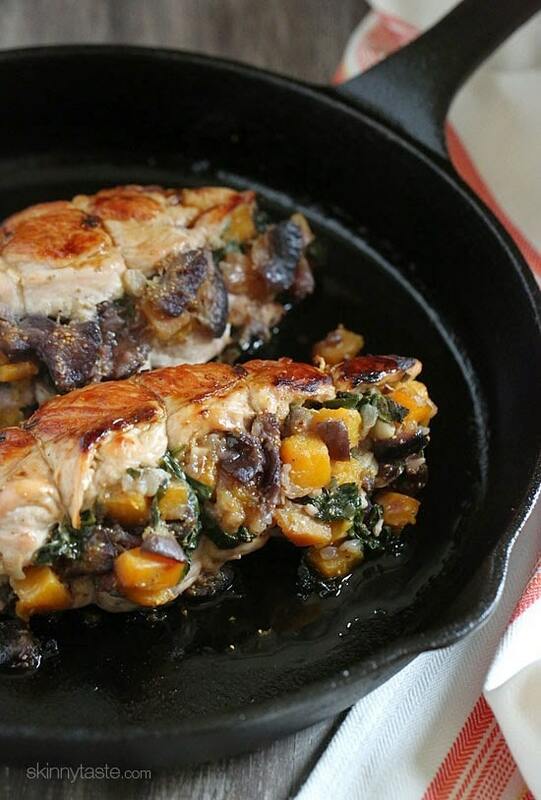 Turkey tenderloins are stuffed with sauteed butternut squash, spinach and figs, a meal-in-one with savory and sweet flavors. Figs are seasonal, so if you can’t find them, you could use another fruit such as pears or even apples. Covering the skillet while it roasts in the oven prevents the turkey from drying out, and also gives you some pan juices to spoon on top just before serving. 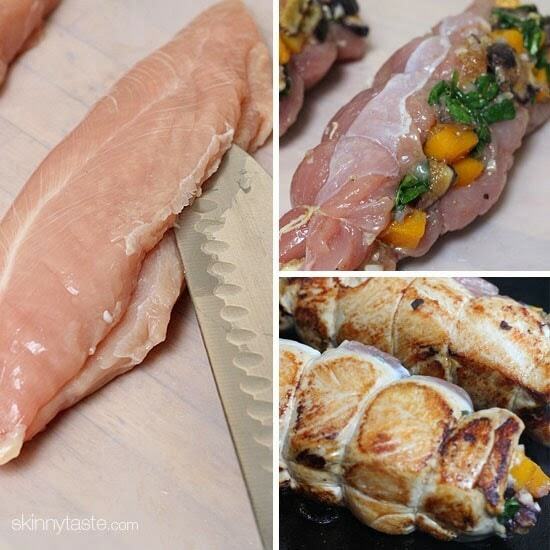 Stuffed Turkey Breasts with Butternut Squash and Figs is a wonderful Fall dish. 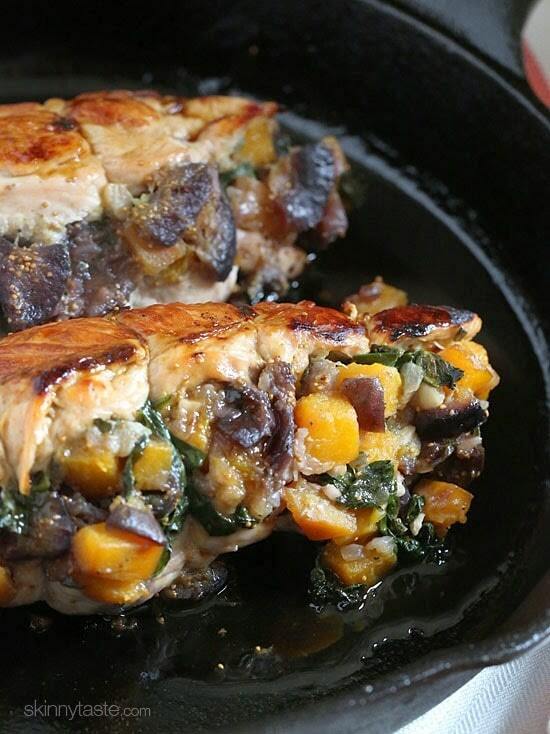 Turkey tenderloins are stuffed with sauteed butternut squash, spinach and figs, a meal-in-one with savory and sweet flavors. Figs are seasonal, so if you can’t find them, you could use another fruit such as pears or even apples. Heat a large cast iron skillet over medium-high heat and add olive oil. Add onions and sauté for two minutes, or until golden. 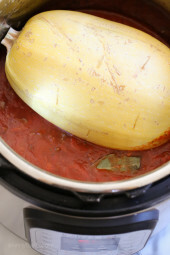 Add butternut squash and 2 tablespoons water and cover; cook on low for 10 minutes. Remove lid and add figs, garlic, spinach, salt, sage, and pepper and cook for another 3-4 minutes. Set aside to cool. In the skillet over medium-high heat, lightly spray with cooking spray. Carefully sear each turkey breast on each side (3 sides. Don’t sear on stuff end.) If your skillet is oven-safe, cover with foil and place in the center of the oven (If not, then transfer to baking dish and cover with foil), place directly into oven and cook for 30 – 35 minutes. 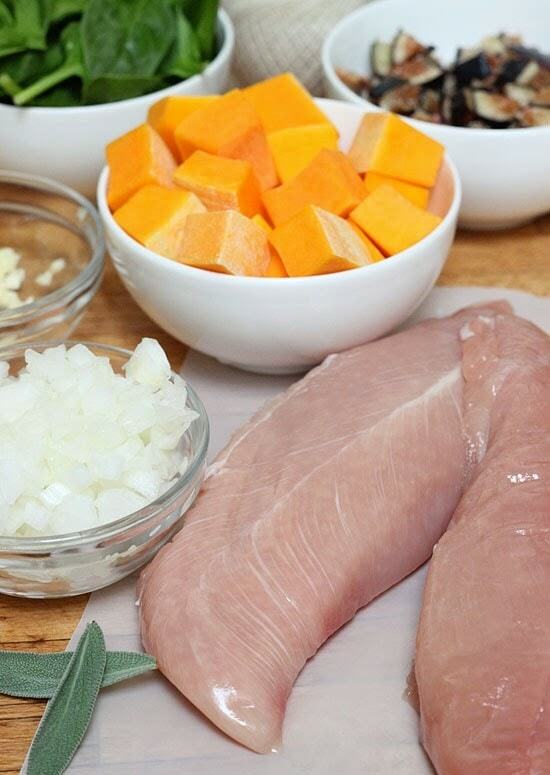 Allow to sit 5 minutes before cutting off twine and slicing each turkey breast in 4 slices. Could you stuff this ahead of time (day ahead) and then brown and bake the next day? I’m thinking of making these for Thanksgiving. Just made this for dinner tonight with a couple of modifications. Instead of stuffing the turkey tenderloin I just made the stuffing separate and served them together. Still browned the turkey breast and baked in the oven the same way, I think the cooking time was a little shorter, just checked internal temp to know when done. Used dried golden figs instead of black mission figs, I think golden raisins would be really tasty as well. Served with the Brussel Sprouts Au Gratin – I think I may have found what I’m serving on Thanksgiving. I made this two nights ago with turkey thighs, as I wasn’t able to find turkey tenderloins. I pounded out the thighs and made them into rolls instead of being stuffed. I also couldn’t find fresh figs, so I used dried. It came out amazing. We love this! So hearty and flavorful, kids agree! We’ve made it a few times and our technique has improved with time, still end up with stuffing totally overflowing but it cooks great and still looks and tastes wonderful. Wowee! Just made this for zero FS, and it was delicious! I struggled to stuff my chicken breasts (alittle small) so served the filling as a side with the roast chicken, delicious, especially if you grill it at the end to add some crunch! This is a great recipe. Definitely a go to one, would definitely make it for company. The turkey was moist and very flavorful. I substituted oregano for sage and it was delicious. Not one would ever know it is a weight watchers meal. My sister made this for dinner last night! Absolutely delicious! She used dried figs and we just loved every bite of this meal. You can bet I will be making it again soon! I made this for Christmas Day dinner for 11 people yesterday and everyone raved about it! Definitely a keeper and it will be on the menu every Christmas. I used chicken breasts, doubled the ingredients (but otherwise followed the recipe to the T) and it came out juicy and flavorful. I stuffed the breasts one day ahead so all I had to do was sear and bake. Served it with rainbow potatoes, salad and cranberry sauce w pears from this site. It was a big hit! I have both cookbooks and LOVE your recipes. Thank you. I am over the moon that these are now only one Smart Point – tempted to have a whole instead of just a half. I made these for a dinner party (when they were still 2 Smart Points) and everyone raved. For some reason turkey tenderloins are hard to find where I am, so I substitute Chicken Breast, but it does not alter the Smart Points!!!!!! So happy. I wasn’t able to find any figs (fresh or dried) so I substituted with pears. I would NOT recommend doing this. The recipe turned out very dry and bland. I think figs add a necessary sweetness to this recipe that pears just cannot match. This was amazing. Used large chicken breasts, instead of turkey.. Couldn’t get fresh figs so I used dried white figs. Otherwise, made as written. Used my cast iron skillet and drizzled the pan juices over top before serving. It was a little time consuming chopping everything but very easy and delicious. Served with cauliflower mash to keep low carb. Gina, this is an extraordinary recipe! I simply CANNOT wait to try this one out! Thank you so much! So when I type all of the nutritional information into Weight Watchers, it comes to 7 smart points, not 2. Just wanted to let you know. Oh my yum!! Gina, this was absolutely delicious! Made it tonight, perfect Autumn dinner. My husband, the anti-all things vegetable related, devoured this and came back for seconds. Another perfect recipe to add to my repertoire for meals for weight loss. Thank you! This recipe was amazing! Unfortunately, our grocery store didn’t have turkey tenderloins in yet but we used boneless chicken breast. Delish! We added some chopped pear with the figs. Can’t begin to describe what a wonderful dinner. Felt like I was at a restaurant! Made this recently for a dinner party. Couldn’t find turkey tenderloins so used chicken breasts. Absolutely divine. The sweetness of the figs gives this a truly decadent flavor. No-one guessed the entire meal was “Weight Watchers” friendly. Will make this one frequently. Made this tonight–YUM! I am not sophisticated/patient enough to stuff the breasts (what I could find vs. tenderloins) so I put the “stuffing” over the breasts while baking. Worked like a charm and made the stuffing a little crispy/carmelized 🙂 SO GOOD!!! The kiddos asked for more, too! I used dried figs and reconstituted them prior to chopping and adding–worked great. I am confused because I put all the nutrition facts into Weight Watchers and it said it was 7 SmartPoints for the serving (2 slices) but above it says it is only 2 SmartPoints. Please explain, thanks! I also just used the WW calculator and came up with 8 points, BUT … if you take out the stuff that usually doesn’t count as Smart Points – like the figs, butternut, etc., then it really does come up as just 2 Smart Points. Yes You have to use recipe builder not the calculator to get accurate points. I am actually going to try this tonight. I personally do not care for figs anymore, I was going to substitute with apples or pears. What say you? What do you think? I used dates because that’s what I could find and they were absolutely delicious! This looks amazing and I said OMG, I can’t wait to make this. I am on a keto diet which limits my carbs to no more than 25 grams a day. This recipe is listed under your keto recipes. How disappointed was I when I read a serving is 51 G of carbs, with a net carbs of 46 g. I am really hoping that this is a mistake. 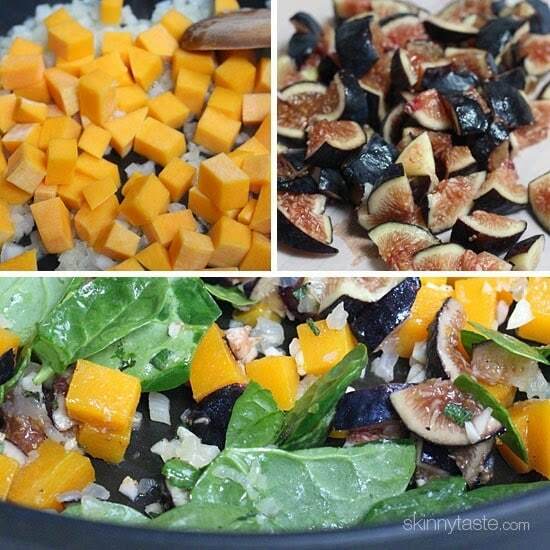 I could possibly eat this minus the butternut squash, the figs, but this changes the recipe completely. Please clarify.. Sorry it is not Keto! This looks great! Thanks for adding a keto option to your categories! I’ve loved your recipes and blog for years, but it’s become a bit more occasional since I went keto. I’ve been using the low carb category, but now it’s even easier! Thank you! You’re welcome! Glad you are finding it helpful! We are usually great fans of SkinnyTaste recipes and have the cookbooks, but this recipe seems to be written incorrectly. It gives the reader/cook the impression that 1 tsp. of salt is added to the veggie stuffing mixture. which is way too much. It should be divided between stuffing and seasoning the meat. I went against my intuition and seasoned & cooked the stuffing mixture per the recipe but had to throw it out and start all over again, wasting money and half hour prep/cook time. Even after all of that, my family was not a fan of this recipe. Can’t win ‘em all. Looks amazing! What is the sauce that is being spooned on in the picture? I was excited to make this because it looks delicious!!! You have this listed at 51G of carbs, which absolutely is not keto and I’m following it. Sorry Julie, I will adjust. Hi Gina – I’m confused. 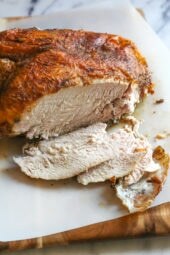 The recipe title says “turkey breast” but the recipe instructions say “turkey tenderloin.” The breast and the tenderloin are different parts of the animal (the tenderloin is between the turkey’s breasts) – which one is the recipe intended for? Thanks! This recipe says 2 smart points per serving. Is this correct? Would love to see an instant pot version of this! You can probably cook it for 15 minutes is my guess? Would it be okay to make the night before? Or at least cook the stuffing? Can I just make this as a side dish without the turkey or will it not be as moist? Thought it would make a delicious gluten free option in addition to traditional stuffing. And if so, how long should I bake it for? I haven’t tried, I would probably add some gluten-free bread to the mix. Could this dish be made with a single large turkey breast? How would it change, baking time-wise. Yes, but I would be guessing the time. I tried this on Sunday and used dates instead of figs. Also didn't use baby spinach and substituted the safe with summer savory. The dish STILL turned out delicious! Tender, juicy and FULL of flavor. So easy. Thanks this one is a keeper. Thanksgiving dinner, a winner. I couldn't find the figs (out of season ). So I used dates, the dish was delicious. I made this tonight and it was BEYOND amazing!!! I left out the figs and used dried sage because that's all I had. Was sooo easy!!! I found the figs in a package in the produce department of a local supermarket with the dried fruit. Do you think the turkey will dry out if I prepare this ahead of time, refrigerate it and put it in the oven to finish cooking when I get home. I have made this twice before and got rave reviews from guests! Thank you so much for your recipe! If you substitute pears for the figs, what kind and how much is best? Also, what is your suggestion if I wanted to add some kind of cheese either inside, or on top? Thank you. Love the cookbook! I'm making this for a dinner party coming up on Nov 22 and I was wondering what you would suggest as a side dish? anyone else have suggestions? I made this tonight. I'd never in all my years of cooking used kitchen twine, so that was new. I found it hard to contain the stuffing inside the turkey, so I ended up simply reheating some of the stuffing to serve the turkey and included stuffing over it. The dish developed a nice "au jus" in the oven, which I served over the dish, yet I found the turkey meat dry. If I were to make it again, I'd make the filling and serve some sort of meat (chicken or pork) over it, rather than trying to stuff the turkey tenderloins again. side by side in one pan? I can't tell you enough how DELICIOUS this recipe was! It will definitely stay in the meal rotation. Thank you for sharing! I was wondering if you can use acorn squash instead of butternut squash? Looks so amazing I will have to try when it gets to Autumn. I just made this recipe for dinner last night (except with chicken breasts, as the local Winco only had bone-in turkey breasts which I didn't feel like dealing with) – man oh man was it delicious! I think I slightly overcooked mine, so while the flavors were still delicious, there was very little pan juice, and the colors weren't quite as vibrant. But holey moley, this was so.dang.good! I too just got my cookbook (and the one I ordered as a Christmas present!) – so beautiful! It was on my desk at work and everyone who walked by was asking me all about it. Easy to rave about, as nearly every recipe I make is from your site. Thank you for yet another hit! I saw Turkey tenderloins at Kroger packaged for about $9.50. Hard to tell if one or two were in the package. It did not look like much, so kind of pricey if trying to serve 6 adults. Where are others finding the tenderloins? I bought some chicken breasts to stuff to try the recipe, but would like to find turkey as a possible Thanksgiving alternative to a whole turkey. (If my kids will let me do it without complaining.) Thanks! Delish! Used apples in lieu of figs. Made more stuffing then I could fit into my turkey tenderloins but served extra on side. Paired nicely with an apple/raisin cocoucos and green beans almondine. Will be making again! As good as it looked! Spooned the cooking juice on top:)Both my husband and I ate ..all of it..w/ small baby potatoes.. I used large chicken breasts..Perfect cooking time. Made it today and it was spectacular. It takes longer than 35 minutes to bake, but worth the wait. Ok, I'm hungry now. This looks so delicious. I'm gonna show this to my wife right now! Could you substitute dates for the figs? This looks delicious!! Thanks for the recipe!! Oh boy, those pictures made my mouth Water! Can't wait to serve this dinner for my neighbors on Sunday! Can you tell me what the carbs and sugar in this recipe is? This looks awesome. I just wish I wasn't the only one in the family to like turkey and figs. I agree with Nana- I am going to put all my printed recipes into the back of the book as well. I LOVE this book Gina!! It's so well done, very beautiful text and fonts. LOVELY!! Thank you so much for this blog and for the book- I was thrilled to buy one. I wish ALL of your roll-up recipes were in there but that's okay- I still have them. The eggplant is my favorite! SO fast now that I have a beautiful mandolin! Wait- you cost me a lot of money this summer!! Hahah I bought a XOXO mandolin and the spiralizer that you use!! My bestie said -" don't you have enough kitchen gadgets?" I said to her- Is there such a thing? Thank you Jana!! I know, I was only allowed to use 25 from the blog, it was so hard to choose! I just received your book this morning from Amazon.ca..
Another thing I like about it..apart from the new recipes I have not tried..is that I can now just insert the printed up copies of my favorites I have made of yours so far..in the past..and tuck into the book..so now you are all in one place. Your mom and dad must be grinning ear to ear. Holy smokes that sounds incredible! Confessions time, I've never bought figs! 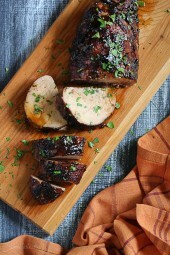 This looks delicious….I'm thinking one could eliminate turkey breast and still use recipe for a great side dish!!! Sounds fabulous!! I pre-ordered 2 of your cook books and received them yesterday. I am so excited to try some of the new dishes. Also the book itself was put together very professionally. I bought the second one for Christmas present. Looking forward to hopefully many, many more cookbooks from you down the road!! Great job! Is the serving size half a tenderlion? I've never tried butternut squash in my life! Can someone tell me what it tastes like and what texture this would have? The dish looks super delicious but I'm afraid of tasting new things (major picky eater here) is butternut squash sweet? Yes, it's sweet on it's own but sweeter with added brown sugar! I sometimes serve butternut squash instead of potato. Can't really think how to describe the texture, tho. I'd say make the recipe as given and if you don't like the squash, just pull them out. Oops, I meant – Enjoy! Thank you both for the encouragement, I am going to try the recipe once this weather cools down a little so I can turn on the oven. Wow this looks amazing!! I love the combination of flavors here. Sadly, I haven't seen figs in stores lately. You really think apples or pears would still be delicious in this? I think it would, or use dried figs. What a delicious looking combination. I like how all the ingredients are good for you too! I'll be trying this for my next dinner party for sure. Accompaniments? Brown rice, couscous? Mashed potatoes? Oh I am totally drooling over this. Saw it on IG and had to run right over. Pinned and can't wait to try it! any suggestions for something to replace the spinach? I hate spinach but otherwise this recipe looks amazing. Help! Thanks for the deelish recipe!!! How long do you sear the breasts on each side for? I'm a huge fan of your blog! You are such an inspiration. I'm in the planning stages of starting my own travel blog. Do you use mailchimp or aweber, or which do you recommend? Thank you! I only used Aweber for the cookbook. Dried dates would be scrumptious too. Can't wait to try this! So many of my favorite ingredients…all in one! Thanks! And btw…love, love, love your new cookbook! It was a nice surprise in the mailbox on Monday! I think this could work with dried figs as well! This looks sooo good! I love the figs in it! this looks heavenly! Paleo friendly too- YES! Where can you find the figs? My supermarket carries them, farmers market too. Trader Joe's, if you have one nearly, has been stocking frozen figs which might be worth a try. ijp from this page: "Figs are seasonal, so if you can't find them, you could use another fruit such as pears or even apples." Thanks, Yes, I did read that, but I love figs. If I don't get response from Gina, I will try with the soft dried figs and post how it turned out. I used fresh peaches, added a few raisins, then squeezed lemon juice over the the dressing. And I used chicken tenders instead of turkey breast It was to die for! I can't find the fresh or the dried figs. OMG this looks amazing! Will make this over the weekend. If I cannot find the fresh figs, do you think I could use "soft dried" figs? My market sells them imported from Italy. They are soft dried (sometimes known as "French dried") so they are not hard, just dried by soft (sort of like dried apricots, just not as moist) . do you think that would work? Yes, just chop them up, it would be delish with dried!